THIS ITEM IS NOT AVAILABLE AT PRESENT. WE WILL NOT BE GETTING ANYMORE Marvel Avengers 2 Age of Ultron Iron Man Pop! Vinyl Bobble Head Figure. From the The Avengers Pop! Vinyl collection by Funko. 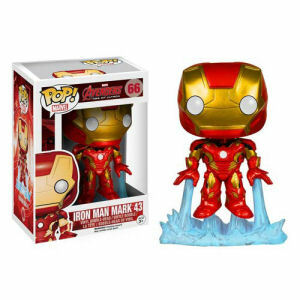 Marvel Avengers 2 Age of Ultron Iron Man Pop! Vinyl Bobble Head Figure. Vinyl Figure Measures 3.75 inches tall.